Enthralling and all-encompassing, this is a fantasy novel that reaches into the depths of our modernity and triumphantly mixes it with legends of old to create a stunning new adventure. Although I wouldn’t ordinarily offer up as Book of the Week a book that’s the first in a trilogy, and ends on a cliffhanger when book three hasn’t been published yet, I am on this occasion making an exception, because book one is exceptional, and book two ends on a satisfactory note, leaving you wanting more but not disappointing. Philip Womack takes his extensive classical knowledge and moulds it into a story that features our current world full with modern references of Sainsbury’s, mobile phones, and rock music, but then splices it with a fantasy world of shadows, murderous swans, and golden deer with wings. 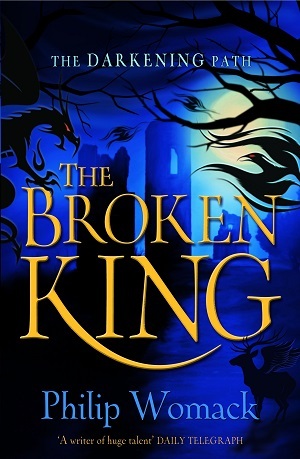 Simon’s sister is taken away, kidnapped by a dark force, and with his parents and own world held in a kind of suspended time, he must venture into the kingdom of the Broken King to retrieve his sister. Along with him is sixteen year old Flora, whose brother has also been taken. The plot follows the traditional line of a journey into the unknown, with riddles to solve and dangers to avoid. However, the dark imagery is startling, refreshing and bold – Womack uses the loneliness of teenagers and weaves it into their fears and nightmares of the dark other world, he dips into territory as yet unexplored in children’s fiction – maps made from human skin. I loved that he imposed physical scars on the two teenagers, so that the pain from their scars reminded them of their quickness to anger at their siblings, and how selfish they had been; how the kidnappings were their own fault. He touches on a subplot of a power struggle in the other world, as well as references to the troubles the teenagers have in their real lives – something that rounds their characters and keeps rooting the fantasy in reality. There are numerous references to classical literature, the golden bough, Greek gods, Arthurian legends and comparisons of Womack’s writing have been made to Alan Garner, but this is a series firmly planted in our own times – with skyscrapers in the fantasy landscapes, portals in supermarkets, and tourists at the British Museum who aren’t what they seem. I devoured it in one sitting – your children will doubtless do the same. 9+ years with strong constitutions. You can purchase it here, or buy on the Amazon sidebar. 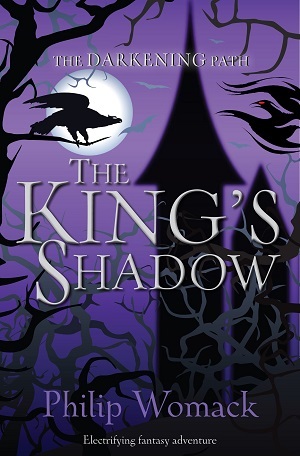 The second in the trilogy, The King’s Shadow is out now and is available here .